Hey there, I have got another TRX suspension workout for your legs thanks to Suspension Revolution creator, Dan Long. These 3 exercises target your core and your lower body, working your legs giving your thighs a great burn. If you are looking to add a little more muscle to your quads and give them more definition, you must add these TRX leg exercises to your routine. Standing with feet together, facing anchor point. Place your arms straight out in front at shoulder height, palms down. Step out with your Right leg into a side lunge and push off back to start position. Then step out with your Left leg into a side lunge and return to start position. Repeat as many times for 30 to 45 seconds. Sitting on ground, place heels in handles facing anchor point. Lift body up on hands into a reverse plank. Curl your left knee up to chest, and then right, alternating quickly. Do as many reps as you can for 30 to 45 seconds. Standing with feet together, face the anchor point with arms straight out in front at shoulder height. With your palms facing down, lift Right foot off ground behind you and out to your left. Lift Left foot off ground behind you and out to your right side. You can either alternate by going left and right or you can do left leg first then the right leg. Watch Dan Long demonstrate these suspension leg exercises in the video below. If you want more exercises like these, then you need to check out Dan Long’s Suspension Revolution program with over 191 unique exercises. Dan’s workouts target your core by building strength and in turn giving you a body that will turn heads. No matter whether you are a beginner, intermediate or advanced, he has you covered with exercises that will help you build up your strength. 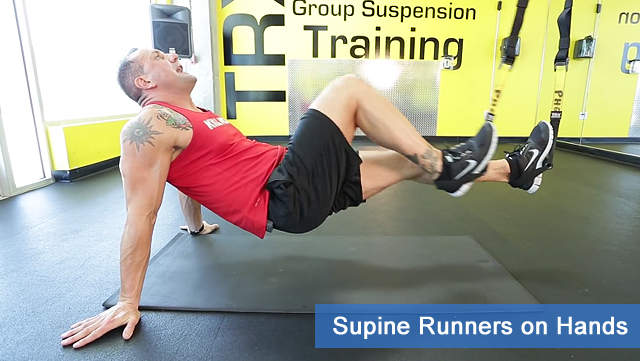 Be the first to comment on "3 TRX Exercises For Great Legs"